​The Bowers love to design and craft all kinds of things. Creativity is the boredom-buster at the Bower home. Gary & Jan have been married 40 years and have 12 creative children, ranging in age from 39 to 15. Many of their 25 grandkids have posed for illustrations in their picture books. Gary Bower is an adoring dad who strives to write books that have appeal both to children and grown-ups. He says, "A book that is relevant to a wide range of age levels offers a way for parents to springboard into natural conversations with their kids." Gary has written over 25 books, and recently completed his first novel, a Christian fantasy for young adults. Young people (ages 9-24) perform with G.U.S.T.O. (God Using Students to Tell Others) in a summer and winter show each year, using well-known oldies and show tunes with an added spiritual twist. The group is directed by Jasmine Bower, while Tynae Bower choreographs the routines. 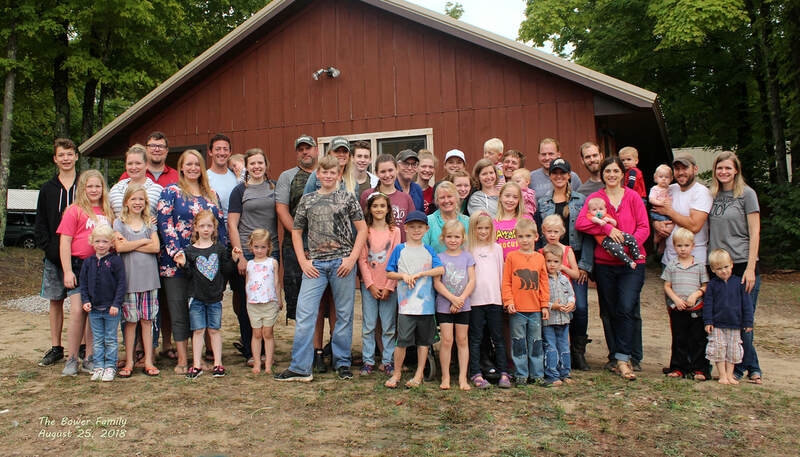 Gary & Jan with their whole clan at their annual family camp, August 25, 2018. Nathan & Jennifer Bower and their amazing clock gallery feature Nathan's award-winning handcrafted clocks and Jenny's beautiful engravings. Austin & Bethany Bower are Bee Joyful Soap Company, creating fragrant all-natural skin care products in their home. Their beeswax soaps, balms, & salves are wonderful! BowerArts is the umbrella name of the Bower family's business / ministry. We are a business in structure, a ministry at heart. BowerArts encompasses everything that is creative about us, including our web presence, publishing enterprises, art studio, and private dance studio. BowerArts also promotes the various creative and independent businesses privately owned and operated by Gary & Jan Bower's children. Bower Family Books is the retail division of Gary & Jan Bower's business by which they sell books to the general public at various shows and other events. Though we don't have an actual brick and mortar store with regular hours for the public, we welcome people to call ahead and make arrangements for picking up books at our home studios Mon.-Sat. Storybook Meadow Publishing is the name and imprint of Gary & Jan Bower's publishing company by which they write, edit, design, publish, and distribute their own books. Their home studios are on a piece of Jan's parents' family homestead. Gary & Jan built their home in 1990 and added our studios in 2006.